Welcome to William Torbitt Primary School. It is a school that lies at the heart of the community, where the children’s learning is paramount, and the learning of the whole school community is highly valued and encouraged.There are high expectations of staff as well as pupils, and a continual striving for excellence. Click here to see what our pupils have had to say. Click here to see what parents/carers have had to say. We believe that when children feel valued, safe and are well-supported and appropriately challenged, they make good progress and achieve well. To this end, we work hard to ensure there is very much a family feel here, even though we are a large primary school, with well over 730 pupils. It is also our belief that children achieve most when the home and school are working together, so we see parents/carers as partners in their education. Our schools has 3 classes in R, Years 5 & 6 and 4 classes in Years 1,2,3 and 4 as well as a 52 place nursery. The school is well resourced, with interactive whiteboards in every classroom, a purpose built cookery room, library, ICT suite, sensory room and multi-purpose community space. Our nursery is a large open plan space with a very spacious outdoor play area. 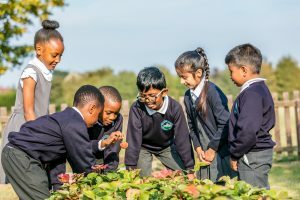 The school itself is set in extensive grounds, with an orchard, allotment plot and wildlife area; an invaluable outside learning environment for the children. Come and visit to see for yourself. You’d be most welcome.